That means this week is Black Cat Appreciation Week! My week! Oooooh, I sooooo hope this will be my week - wouldn't it be awesome if I found my forever home today, or tomorrow, or the day after?" "Do you need a fearless sidekick who's not afraid to take down the fluffiest toy mouse or tackle the tickliest feather wand? That's me! I'm Samantha, and I want to be your gal Friday, Saturday, and the whole rest of the week. I love being petted almost as much as I love to play. What happened to my ear, you ask? Well, let's just say the sidekick life can be dangerous sometimes. Don't worry, though. I can still hear you just fine when you tell me what a gorgeous girl I am. If you're looking for a face with character, you've found your match. Oh and - rumor has it that I love to have my face scratched: check scritches are the BEST! And please, won't you join me down here on the floor so I can wind myself around your legs and hang out? Oooh, I just can't wait to meet you! Samantha's available at Allie's Alma Mater, Wayside Waifs! 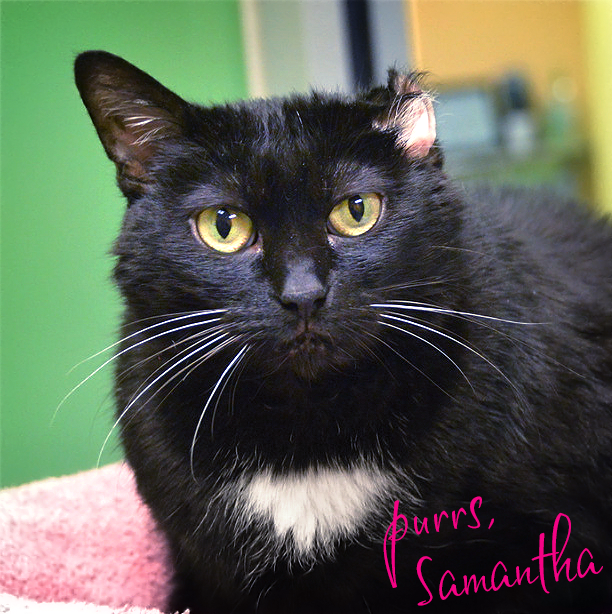 Samantha, whatever happened with your ear, it is a cool fashion statement! Great post, Lisa! Samantha is definitely a glamorpuss. I'm sharing this post on Google Plus and Facebook, combining two of my favorite things: Photography and Cats in conjunction with National Photography Day (today!) and Black Cat Appreciation Day on Monday. Samantha, you are a beauty! Purring that you find your forever home VERY soon. You have lovely eyes Samantha. I hope you soon get your forever home.